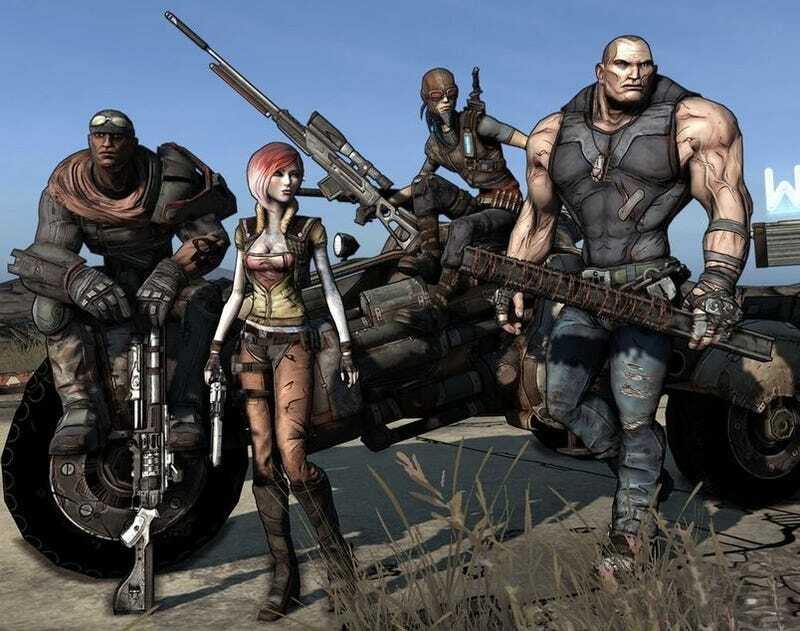 Gearbox Software artists are sensitive about the whole cel-shading thing for Borderlands. They like to call it gritty realism or concept art. But how did a game so far along get a total art make-over? Randy Pitchford, president of Gearbox, said that a couple of artists got together and started complaining about the look of the game. They felt, he said, that all games were really starting to look a lot alike. "They were looking at pictures of concept cars and started asking why they never get to drive them in game," he said. "So four of them got together and prototyped this new look out. Then they roped more people in to help them." "It was like a subversive coup going on." When the artists came to Pitchford to tell them about his idea he told them that there was a "million percent chance" he was going to have to shut them down. "They went ahead and worked on it and set up a presentation in a conference room," he said. "When I saw it moving, saw what it looked like, I was like holy crap. "It looked like Borderlands but it's in a style I'd never seen before." The new style has characters with strong ink outlines, like what you've find in cel-shaded art, but the characters themselves look hand painted. The team also clamped the shadows down on the characters and did some "interesting" lighting to keep the semi-realistic feel of the game, Pitchford said. "I couldn't believe it," he said. "I was stunned." So Pitchford grabbed up the presentation, hopped on a plane and flew to 2K in October to show them the new look. "I was terrified to show them," he said. He started by showing it to Greg Gobbi, one of the people who showed strong support for Bioshock in its early days, and Gobbi loved it. "I was like, thank god," Pitchford said. "We kept having meetings and the meetings got bigger and bigger, until we had this giant meeting and they loved it." So far, Pitchford said, the reception has been pretty positive, but E3 was a big test for the game and its new look. "The team is terrified," he said during an interview early in the show. "I'm scared shitless." "We are seeing a lot of positive feedback, but I'm still afraid for when we launch the game. Sometimes we are rewarded when we take risks, sometimes..."